Talent Management, embodied in attracting, retaining, and motivating superior employees is a critical issue as it is amongst the top concerns for modern corporations. The turbulent economic and social contexts push organizations to strive to be a talent magnet for the best employees in the labor market, and exacerbate the necessity of deploying effective strategies to motivate them. More specifically, the inevitable impact employees’ turnover rate has on the investment and cost-mitigation strategies, renders the issue of employees’ retention a top concern for all companies. This is even more relevant for local organizations that are more vulnerable to the economy’s conditions and complexities, along the competition they face from the more well established MNCs which are generally more attractive to employees, especially Gen Y workers. In light of this, it is undoubtedly crucial for any corporation to understand and pinpoint all the factors that would contribute to its employees’ departure or retention. This, however, is not an easy job as it requires more than making assumptions. That is especially true given the complex characteristics of today’s workforce with their ever-increasing needs and expectations; whether in terms of their working environment, nature of work, management style, work-life balance, or personal and career development. The inter-dependability and multiplicity of these factors, therefore, necessitate organizations to take a systematic and an objective approach to identify, highlight, analyze, and understand these factors; and use such invaluable knowledge to inform and guide the strategy formulation and decision-making processes. This report sheds the light on some of the findings of a Stay Survey that was conducted in one of the leading companies which has been operating in Egypt and the region for more than 10 years, with a workforce of more than 1000 employees. The survey was intended to gather a broad feedback about the reasons for which employees are staying within the corporation and use the findings to guide its employee retention strategies. The identity of the organization is kept anonymous in this report for the sake of confidentiality. The first section of this report discusses the data findings, and the second section provides some recommendations and action-oriented suggestions. This section highlights the insights excerpted from investigating the relationships between employees’ age, gender, and years of experience, on one hand, and reasons for staying, types of recognition favored, and preferred job aspects, on the other hand. Employees’ responses regarding the reasons for staying within the organization reveal that ‘Sense of Belonging in a Market Leader Company’ is the number one reason, followed by ‘People & Work Environment’ as the second reason. The third, fourth, and fifth reasons comprise ‘Skills Development & Growth’, ‘Professional Management Style & Recognition’, and ‘Compensation’ respectively. More specifically, when looking at the relationship between employees’ age and reasons for staying, the same ranking of the five above-mentioned aspects is observed for the age groups (25 and below), (26 – 35), and (36 – 45) but with different percentages. The case is, however, different for the age group (46 and above), where ‘Skills Development and Growth’ comes in the second place, ‘Compensation’ in the third place, ‘Professional Management style & Recognition’ in the fourth place, and ‘People and Work Environment’ in the fifth place. These findings are illustrated in Figure 1 below. Data for the relationship between age and the preferred type of recognition reveals that moral recognition is more preferred by the four age groups than monetary recognition, as illustrated in Figure 2 below. Each age group, however, prefers different ways of moral recognition. The ‘Below 25’ age group prefers, both, a ‘thank you card’ and ‘personal acknowledgement’; the ’26-35’ age group prefers a ‘thank you card’; the ’36-45’ age group prefers ‘public acknowledgement’; and the ’46 and above’ age group prefers both types of acknowledgement – public and personal. When investigating the relationship between gender and the type of recognition preferred the most, it is found that, both, males and females generally prefer moral recognition. More precisely, a higher percentage of, both, males and females report that they prefer the 3 types of moral recognition – collectively– over monetary recognition. 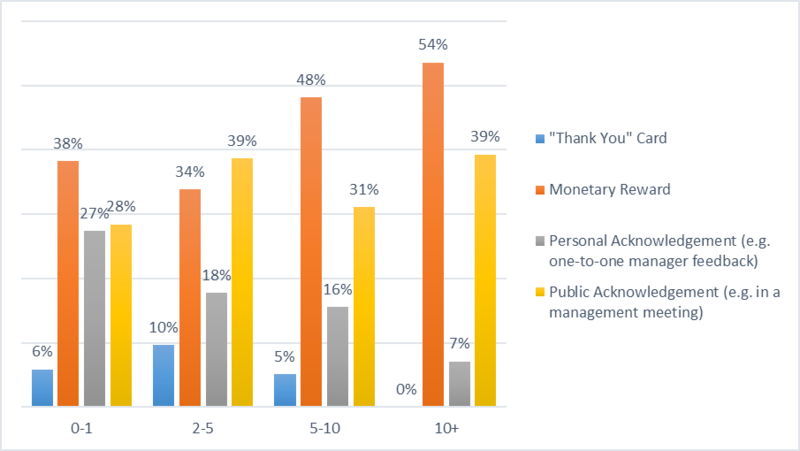 Nevertheless, findings reveal that a higher percentage of male respondents prefer monetary recognition compared to female respondents- as illustrated in Figure 3 below. As for the relationship between job tenure and the preferred recognition type, data findings reveal that moral recognition is preferred by respondents who have up to 10 years of work experience; yet, for employees with more than 10 years of experience, monetary recognition is favored. This is shown in Figure 4 below. With regards to the aspects of the job liked the most, ‘Dynamic and Challenging Work’ has received the highest response rate by, both, males and females, followed by ‘Accountability and Making Decisions’. In the third place comes ‘Details & Quality’ for males and ‘Details & Quality’ and ‘Innovation’– sharing the same position- for females. 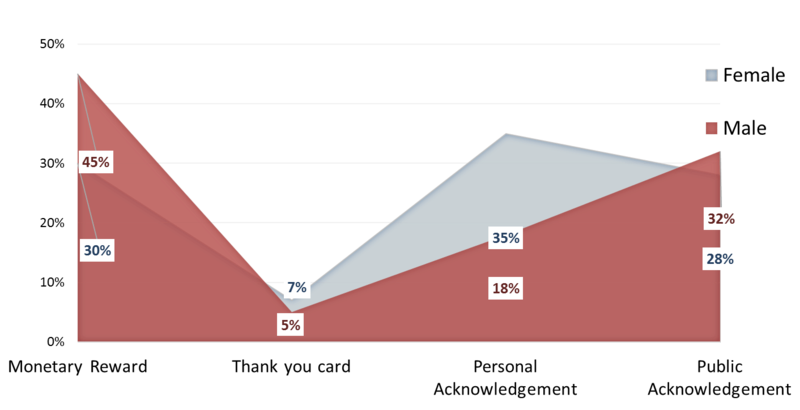 ‘Motivating and Coaching Employees’ comes in the last place for, both, males and females – as illustrated in Figure 5. Based on these findings, the following points are accentuated as recommendations to be considered for implementation in similar cases. The perception employees have for the company as a market leader company should be strengthened, backed, and sustained by an Employment Branding project/initiative. This shall shed the light on its position, both, in the market and in the eyes of its employees. Two main channels of communication can serve to do this: The Employment Fairs and the Social Networks such as LinkedIn. The corporation should be promoted as a talent magnet and a top-notch employer that attracts and hires the best talent and exceptional calibers. This, in fact, requires to, primarily, revisit its talent management strategies and employment promotion techniques. Employees at all levels should be constantly guided by an inspirational mission that emphasizes the corporation’s leading position in the market and highlights the significance of maintaining this position. This would help create and/or strengthen employees’ emotional attachment to the organization. Establishing & maintaining an effective two-way communication would also strengthen the employees’ sense of belonging as they would feel that their voices are heard and opinions are valued. Formal channels of communication that would help to achieve this (e.g. in meetings, closed social media groups, etc..) should be encouraged. This includes encouraging feedback from employees, as well as being transparent and prompt in providing feedback – whether about employees’ performance or the overall organizational performance. There should be synchronization and harmony among the different levels and aspects of the organization’s culture. In other words, the company should ensure that the espoused values are deeply embedded and reflected in the organization’s vision, goals, strategies, and policies; as well as in the organization’s structures and business processes. Any incongruence could back fire, resulting in employees’ demotivation or mistrust. It is also crucial to ensure that the systems, structures, procedures, and policies in place do not create divisiveness, gaps, or barriers between employees across the various departments (horizontally) or between the different levels of the hierarchy (vertically). There should be a deliberate approach to creating and facilitating synergistic teamwork and team bonding (group activities after or outside the normal working hours). Helping employees create work-life balance is critical to creating and maintaining the sense of belonging they have towards the organization. This should be reflected in, both, the formal policies and the interpersonal interactions (especially between the management and employees). On another note, empowering employees is crucial for creating and maintaining job satisfaction for employees of both gender. As the data findings reveal, employees report that the ‘Dynamic and Challenging Work’ is the most liked aspect of their job. It is, therefore, critical to capitalize on this through providing them with high degree of autonomy and self-determination in their scope of work; which will enable them to experience the dynamic and challenging dimensions of their jobs. That is especially important as empowerment entails a high degree of accountability and decision-making authority which are ranked, collectively, as the second aspect most liked by employees in their job. Developing employees’ awareness of the significance of the training and development programs. Linking the expected advantages or outcomes of such programs to their own career and personal benefits and goals is an important step. Assessing employees’ strengths and areas of development; which is critical to identifying the training needs effectively and accurately, and thus facilitating the process of getting employees committed to attending and benefiting from this training program. Getting employees involvement in identifying their training needs and in setting the training agenda. This would help achieve the aforementioned benefit and overcome any resistance or lack of motivation. Helping employees see how the training and development programs provided would benefit them on the long-term and not only on the short-term. This would act as an incentive for them to attend or even proactively ask for such programs. Such programs (or at least some of them) should be designed in a way that would help them advance in their own career and personal lives and not only within their current organization’s boundaries. With regards to the type of recognition to be provided by an organization’s management, emphasis should be placed on non-monetary/non-financial rewards as much as monetary/financial rewards. Companies should not undermine the significance and value of providing acknowledgment and praise to their employees as a way for positive reinforcement. The type of non-monetary recognition, however, should be tailored to each and every employee based on the ‘gender’, ‘age group’, and ‘years of experience’ dimensions (as elaborated on in the previous section). Nonetheless, the value placed by some employees on receiving monetary rewards as a way for recognizing their effort should not be overlooked. As the data findings previously presented suggest, male employees place more value on monetary recognition compared to their female counterparts, and employees with more than ten years of experience favor monetary rewards to non-monetary recognition. This paper provides some insights that are likely to be useful for corporations of similar size and scope of operations. The implications deducted from the research findings lay the ground for determining the talent attraction factors for employees in various age groups and with different years of experience. These can be either entrepreneurial factors encompassing the aspects of ‘personal growth’ and ‘recognition and reward’; or intra-preneurial factors comprising the corporate brand image and position in the market as well as the corporate culture embodied in the company’s work environment. Further research into these relationships would, thus, prove useful as the relevant findings could be an invaluable guide for the talent management strategies of corporations.